Habit: Perennial herb to shrub, (0.2)1--12(20) dm, (0.5)1--12(20) dm diam. Stem: (0.1)0.5--3(4) dm, tomentose to hairy or glabrous. Leaf: basal; blades 0.3--3(4) cm, 0.1--2.5 cm wide, tomentose or glabrous. Inflorescence: umbel-like (main branches of 1 order) or compound umbel-like (main branches of >= 2 orders), rarely head-like, 3--25 cm, 2--18 cm wide; branches tomentose to hairy or glabrous, rarely with bracts near middle of branches; involucres 1--6 mm, (1)1.5--10 mm wide, tomentose to hairy or glabrous; teeth 6--12, reflexed. Flower: 2--10(12) mm, stipe (0.7)1.3--2 mm, glabrous; perianth white, yellow or red, lobes generally spoon-shaped to obovate. Fruit: 2--7 mm, glabrous except sparsely hairy tip. Note: Highly variable; many varieties outside California, to western Canada, Montana, Colorado, Arizona. Habit: Subshrub or shrub, 2--7 dm, 3--9(12) dm diam. Stem: (0.5)1--3 dm, hairy or glabrous. Leaf: blades 1--3 cm, 0.5--2 cm wide, generally sparsely tomentose at least abaxially. Inflorescence: main branches of >= 2 orders, hairy or glabrous; involucre tubes 2--3(3.5) mm, teeth 1--3 mm. Flower: 3--7 mm; perianth yellow. 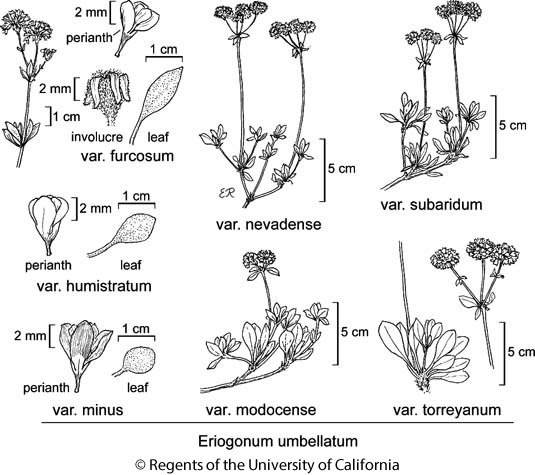 Citation for this treatment: James L. Reveal & Thomas J. Rosatti 2012, Eriogonum umbellatum var. subaridum, in Jepson Flora Project (eds.) Jepson eFlora, http://ucjeps.berkeley.edu/eflora/eflora_display.php?tid=58783, accessed on April 19, 2019.
se SN, TR, SNE, DMtns; Markers link to CCH specimen records. Yellow markers indicate records that may provide evidence for eFlora range revision or may have georeferencing or identification issues. Purple markers indicate specimens collected from a garden, greenhouse, or other non-wild location.